Prior to coming to Chicago, I spent a week in Manhattan, attending Broadway shows and otherwise having a real vacation with no family visits, no work, and no pen stuff–well, except a trip to Fountain Pen Hospital, but that was for enjoyment, not for the blog. I had a great time, but New York isn’t really where you go for a nice, calm, relaxing vacation. (I actually don’t know how to relax. A vacation where you just lay on a beach all day is pretty much my definition of hell.) So, even before I got to Chicago, I was running on fumes. By the time Sunday morning dawned, gray and breezy, I had been on the road for going on two weeks. I was getting worn down. I showered and dressed, and acquired more caffeine-fueled sustenance (and another ghastly pastry, because I’m incapable of learning my lesson the first time.) I headed into the ballroom as soon as it opened at 8 AM, and set up the booth for the final day of the show, which opened to the public at 9 AM. The final day of any pen show is usually a bit slower than on Friday or Saturday. Usually the shows start to wind down early on the last day, as many of the traders start to pack away their folders or leave to catch Sunday evening flights. Sunday at the Chicago show was slower than Saturday, but it was still pretty busy. This is especially true for those retailers who sell ink, as a lot of people are looking for ways to spend their last $25 or $50 from their budget, and a nice bottle of ink is always a fine choice. Earlier in the week on Friday, I had chatted with a lovely chap named Warren about his collection of Parker Vacumatics, of which I have become somewhat enamored of late. So after paying for Sarj’s plane ticket to the next pen show (*cough*) I went off to try and find Warren to contribute to his retirement fund as well. Unfortunately, Warren must have been one of the traders who either didn’t set up on Sunday or left early, as I couldn’t track him down. On Friday, I had also stopped by Manu’s table. Manu is the brave soul who purchased Conway Stewart and OMAS, and is in the process of reviving both of the brands. He also, as I understand it, had a major role in purchasing and helping revive the modern iteration of Wahl-Eversharp. 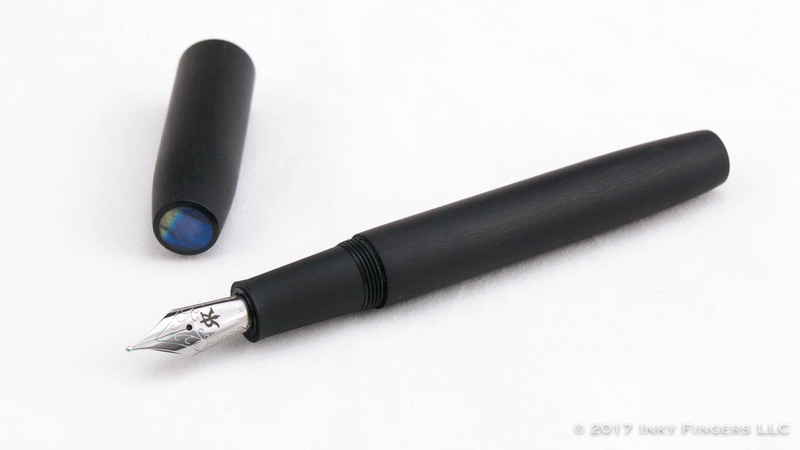 He had a sizable collection of OMAS pens made at the old factory, as well as the prototype for the new version of the OMAS Ogiva made out of OMAS’ iconic brown arco celluloid. The new Ogiva looks identical to the old Ogiva, except they have removed the piston filler and replaced it with a standard international cartridge and converter for cost savings. 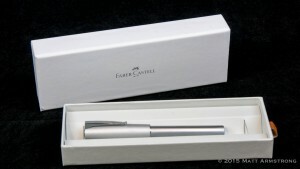 They are going to have a very limited number of these pens when they start coming out, so keep an eye out for those. On Sunday, I wandered back by Manu’s table to see if any of the OMASes caught my eye. I already have a Brown Arco Ogiva and a Green Arco Paragon, so I wasn’t jonesing for a new OMAS, but I still enjoyed looking at them. I then headed out to the atrium, where several pen makers and retailers were set up, and parked myself in front of the table of pen maker (and show regular) Ryan Krusak. 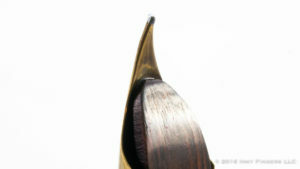 Ryan is a wonderful artist, making pens out of beautiful wood, antler, and other materials. He will often do scrimshaw work on his pens or will hand-paint them with beautiful and intricate nature scenes. I’ve admired his work for years (he’s at every show I’ve attended so far) but I’ve always held off purchasing from him because he used to use relatively slender sections made of metal, and I’m not a big fan of metal sections. Fortunately for me, about a year or so ago, Ryan started making some of his pens with ebonite sections, and they’ve been on my to-buy list ever since. I finally managed to pick one up. He’s got some truly beautiful creations, but one of his newer models really caught my eye–the Legend. There were two versions that I was lusting after. 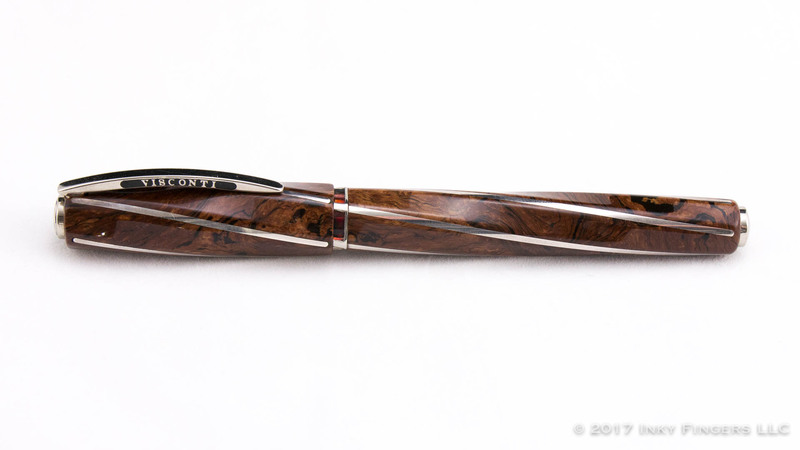 One was a beautiful cocobolo wood pen with inlays of turquoise in either end of the pen. The other was made from ebony wood, and featured inlays of a really beautiful stone I’d never heard of before called labradorite. Labradorite is a beautiful iridescent stone which all but shines with a rainbow of colors from purples to turquoises to yellows and greens, depending on the angle of the light. Against the backdrop of the near-black ebony wood, the labradorite in my Legend is like a beacon. I couldn’t not get it. So the Krusac Legend made its way into my collection as well. I knew I needed to get back to the Vanness table, but I still hadn’t found the right Vacumatic yet, so I went back to Sarj’s table. And sure enough, thar she blows. 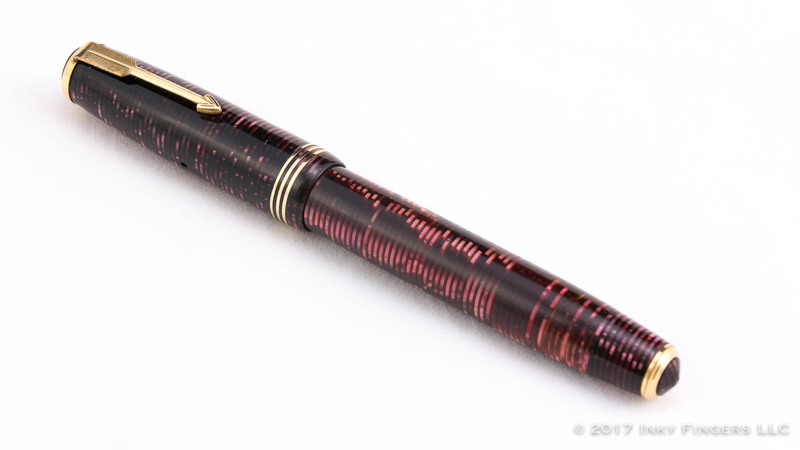 In one of his folders, I found a stunningly beautiful 1937, double-jeweled, Canadian-made Burgundy Pearl Parker Vacumatic Oversize in like-new condition. One of the characteristics of Vacs that collectors use to ascribe value is how much transparency the barrel has maintained. (Inks and off-gassing from latex sacs often causes the celluloid to get cloudy or opaque.) This one was so clear you could almost read the newspaper through it. To top it all off though, the pen had a gorgeous 14k gold flexible factory stub. Flex nibs on Vacs are pretty uncommon. Flexible stubs even more so. This pen was an absolute gem of a find. And it became mine. Public hours on Sunday ended at 4PM, but we continued to sell at the Vanness table even as we were breaking down the display. With the help of some pen friends, we had everything broken down in an hour and a half and loaded up in the ink van for the return trip to Little Rock, AK the following morning. It had been a wonderful show. It’s around this time of every pen show that I start to get a little emotional. I’m a pretty isolated guy in my real life. I don’t have a lot of friends, and don’t socialize much outside of work. So to go to a place where I can be my usual, nerdy self with a bunch of smart, funny, like-minded people means a lot to me. I say this all the time, but the people are absolutely my favorite part of any pen show. Yeah, the pens and the inks are fun, but it’s the chance to sit around a table and pass around my pens while we talk about anything and everything, without feeling awkward or self-conscious, that I really love. I don’t know what it is about pen people, but being myself around them feels so much easier than with the general populace. So, as the shows wind to a close, I tend to get wistful and a bit sad that I’m going to be leaving it all behind for several months until the next show comes along. We were so full we rolled back to the hotel (think Violet Beauregard in Willy Wonka and the Chocolate Factory) and gathered at the bar for the final time. I had purchased a LOT more than I had intended at this show (something like 14 bottles of ink and eight pens…sheesh) and couldn’t fit it all in my suitcase, so I bagged up the pen boxes, ink, wax seals, etc., and passed them off to Lisa to ship to me when she got home. Then I grabbed my pen wallets and my Tomoe River notebook and headed down to the bar. This particular evening would prove to become a special memory for me. In many ways, it was the perfect post-pen show evening. We shared pens, we talked a bit, we enjoyed the company of our pen friends. 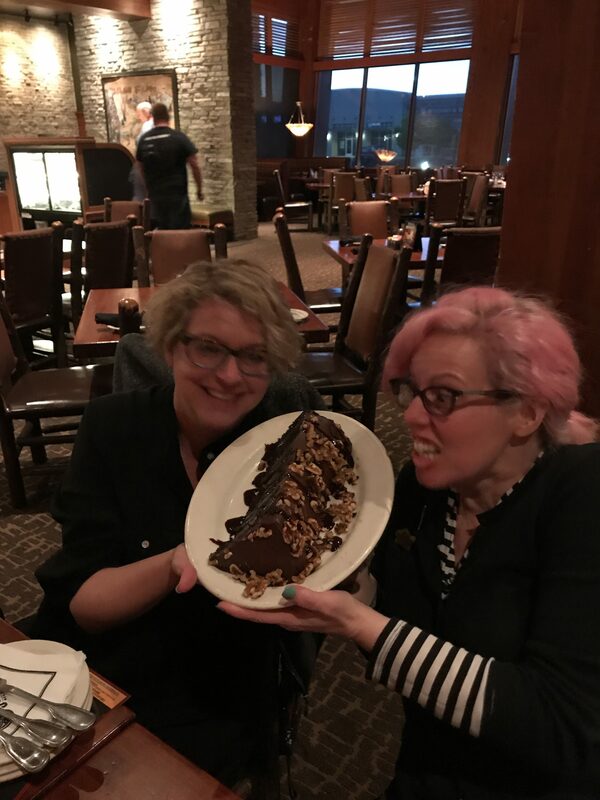 At one end of our long table, pen show icon Susan Wirth had plunked down a large metal sculpture she had purchased at the show, and was gushing over it enthusiastically. She and a few other pen friends were hovering around the sculpture, which liked like an industrial skyline made entirely out of a shiny metal (aluminum. maybe? ), attempting to take some nice photos of such a difficult subject. I sipped on hot tea, and felt relaxed as I passed around my pens while I chatted with Lisa, and Leigh, and John, and Ana, and Tania, and Cindy. A day and a half later, Susan Wirth (Suzie, as I had always heard her called) passed away suddenly. If you’re an active member of the pen community, you’ve likely heard many tributes to Suzie in the ensuing days. She was a fixture at pretty much every pen show, and had been since the ’80s. She was loud, and brash, and demanding, and she loved helping people find the pens that were perfect for them. The number of hotel sinks and towels she left stained from cleaning out her pens has got to be well into the hundreds. I didn’t know Suzie terribly well, but I have a couple of stories about her that I’d like to share. At my very first pen show, the DC Show in 2015, my father flew in from his job site in Philly to attend with me. He had introduced me to fountain pens, then I, in turn, introduced him into what it means to be SERIOUS about fountain pens. (He had used the same pen for over 40 years. Now he’s got over a dozen, and a few dozen bottles of ink.) I get my deep dive mentality from him, so when I try to drag him along into my fastidious habits, he’s well-equipped to join me in my insanity. Dad’s first night at the show, he had just taken a cab from the airport and dropped his bags off in the room. We were heading to the bar, and we found Suzie and my pen friend Chris sitting at a round table that Suzie had plunked smack dab in the middle of the hallway leading to the rooms. The show organizer had shut down the main ballroom and all of the smaller classrooms for the night, but Suzie wasn’t done. My dad stood at the edge of the table, just watching the proceedings. Before long, Suzie plunked him down in a chair and proceeded to spend the next two hours with him, walking him through all kinds of information about pens. We eventually left her at around 11:30 to head to bed, and she was still going full steam, right there in the hallway of the hotel, dripping ink onto the white tablecloth. 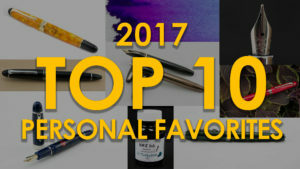 The following February (2016), I attended the Los Angeles pen show, and did a long write-up of my experience, much like this one. That particular show had been disappointing for me for a variety of ways, and I wrote a summary that generated a lot more controversy than I had intended. (I’ve never been good at accurately forecasting how people will take what I write.) In it, I mentioned Suzie. 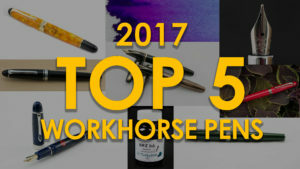 She read my four-part post online and wrote me an email with an eight-page Word document attached that outlined her history with pen shows, her thoughts on how to run a successful pen show, and why some people at shows act the way they do. It was chock full of information. And it was absolutely fascinating. I was getting a bit of blowback from my post (as well I should have) but Suzie’s lovely letter and document offered both support and knowledge that I have found tremendously helpful since. In many ways, Suzie had been a pioneer in our community. She was often the only female vendor at the shows in early days. She liked to, in her words, “keep a little crazy in her back pocket,” and would pull it out when the mood hit. I feel tremendously lucky that I got to see her at the Chicago Show, and witness her excitement over this new thing that she found. When it is my turn to go, I will consider my life well-lived if I can go doing something I love as much as she loved pens, or if I have been able to impact as many lives as she did. Many have termed her the godmother of pen shows, and that’s a title I think is more than a little apt. Her absence will leave a huge hole in our community. So, that was my Chicago 2017 pen show experience. I had been a little worried about this show. Having attended such vibrant, exciting, and large shows like DC and the up-and-coming San Francisco show, I thought I might find the Chicago show to be a bit of a disappointment. I have to say, though, that I had a really great time at this show. It was a smaller show than DC, but it was busy and there were a lot of really fun, interesting people attending. The bar at night was fantastic. The show’s management was engaged and energized. The crowd was interested in coming and learning and socializing and buying. It was a really good group, and I had a wonderful time. This is a show to which I would very happily return.